My sketch books have been busy! 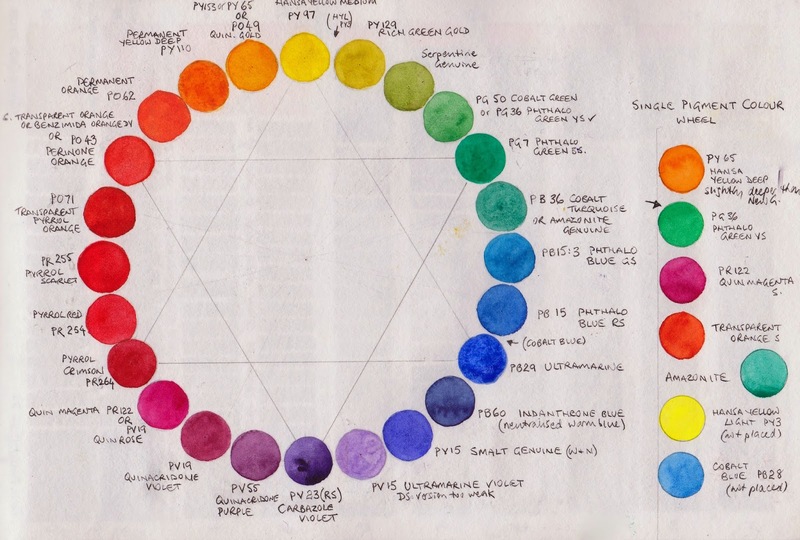 Below is a colour wheel painted out in only single pigment colours. Some are not quite ideal, and not all are necessary, but an interesting exercise to do. Ultramarine Violet in the 5.30 position is very weak in Daniel Smith. Another brand may be better, though it is a weak tinting pigment. Try Da Vinci or perhaps QoR. Amethyst Genuine could go in the 5.30 spot instead, but is very dark and neutralised. Indanthrone Blue in the 4.30 position is also a neutralised blue. Cobalt Turquoise in 2.30 is not as bright and powerful as a mix of Phthalo blue and Phthalo green would be, and is more opaque and granulating but I love it! Amazonite genuine is a more transparent alternative. Cobalt Green in 1.30 would be better replaced with phthalo green YS. In the 11.30 position I have placed New Gamboge, but have mixed Quinacridone Gold below as that's my favourite warm yellow. Quin Rose in 7.30 could equally be Quin Magenta PR122. They are different but are both used as a cool clean mixing red for making purples. Notice the two triangles in the middle connect the primary triad Hansa Yellow Medium, Ultramarine and Pyrrol Crimson and the secondary triad Benzamida orange, Phthalo Green and Carbazole Violet. Together they make fantastic 6 colour palette seen here. Each of these pairs opposite each other on the wheel neutralise each other to a grey or black, creating a huge range of earth and tertiary colours, with the exception of the yellow greens and the red purples. Here they are painted out in pairs. 12 - don't neutralise each other to grey. good for orchids! 2 neither ultramarine violet nor Smalt a perfect combination. Try amethyst? I don't tend to work with a palette of pure bright colours as I love the earth pigments, but it's fascinating to see where they all fit into the palette. 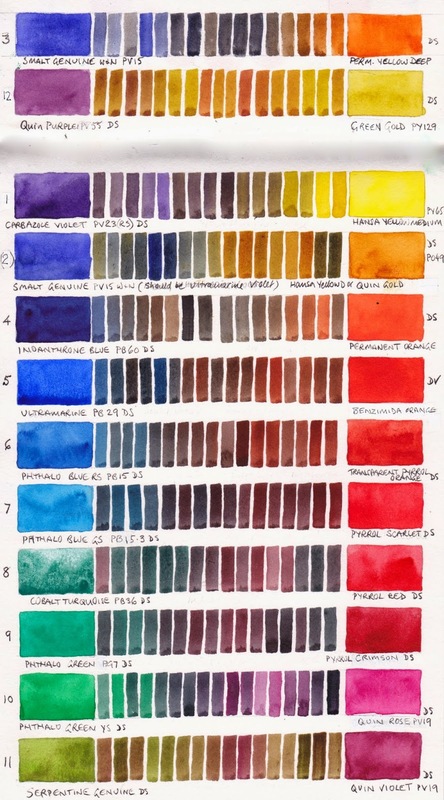 Jane, Do you think this colour wheel would work in acrylic as well as it does in watercolour? Pigments should be the same if based on Pigment number identification, shouldn't they? I think I will try making one and see. i really like the beautiful tertiary colours you have shown by working with the complementary colour pairs. Certainly give it a go - same principals and same pigments though they behave differently. Where in watercolour we add water, in acrylic you often add white - try adding a thinning medium instead so the lighter hues. This is great, thanks for sharing your hard work Jane. Jane, thank you for sharing all this. Many hours of hard work by you and the results are so appreciated and will be very useful. Jane, I am teaching a college art class, Visual Art Foundations. My next lessons are on temperature and intensity. My I show your single pigment chart to illustrate the concepts? I will cite your name and this blog on the slide. thank you in advance. email is colleen.reynolds@wnc.edu. College is Western Nevada College. Yes you may Colleen. Thank you for asking and of course I appreciate you acknowledging the source - always essential. Ive been looking at your website and blogs. Clearly you are enthralled by color, and your enthusiasm is contagious. I did a color chart last night with most of the primaries you recommended. This post is wonderful. I purchased the colors needed to complete the 24 single pigment color wheel. I am looking forward to it as a learning experience in color theory. Is is worthwhile to fill in my Quiller 24 color porcelain palette with these colors and get familiar with it, or was the 24 color wheel intended as just an exercise? Maybe just put filled half pans in the slots so they can be moved when I have completed the mixing / swatches? Is there a benefit in putting your Ultimate Mixing Palette or more in the Quiller palette wheel, or do the convenience colors make it not work crossing the wheel with complementary colors?